Description - TuffCore's newest collection is none other than a water resistant laminate! The Estate collection offers a beautiful real wood look, finished with registered embossing for a truly realistic feel underfoot. High variation color are available in random width and length options, adding to the authentic essence of real hardwood floors. These water resistant planks have waxed edges and 30 hour moisture protection, so you can rest assured you don't have to rush to clean up any messes. Recommended Uses – Estate WaterResist laminate planks are the perfect solution to areas where you want a classy wood look flooring, with the durability of a tough core, at the price point of a laminate. Estate Tuffcore products can be installed throughout the home, in basements, bedrooms, kitchens, laundry rooms, hallways, and more. Boards feature drop lock for easy install. I do not typically write reviews but I was very pleased with the product and easy installation. 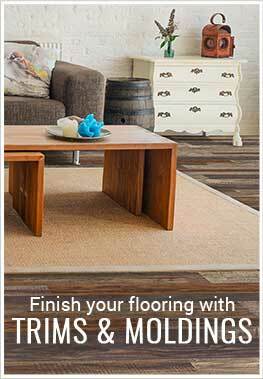 I had a couple of questions and I was able to call Flooringinc and they helped me over the phone. Would give a 10/10 if I could !! I love the modern gray look of this flooring. It looks really great! We are very pleased with our new laminate floor. The ordering process with Flooring Inc went smooth and the product was delivered on time and arrived as expected. We were able to install the flooring in our bedroom in one day and are enjoying its beauty now! The gray stone ended up being my favorite color so we went with that for the bedroom. My husband and I absolutely love our updated bedroom and would like to do more rooms.